Mickey Mouse Platy in Hiding! Thread: Mickey Mouse Platy in Hiding! 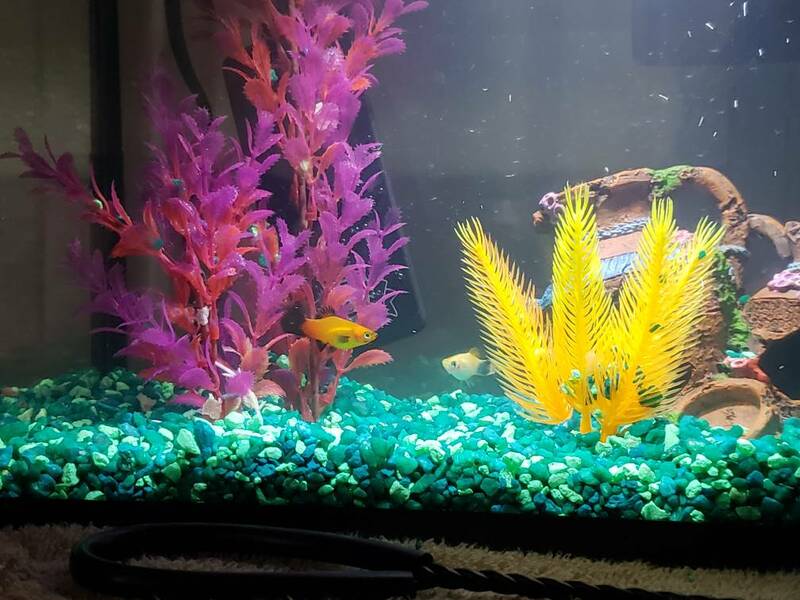 I am new to aquariums and after being told how to properly set up, recently purchased a sunset platy (Solana) and a gold mickey mouse platy (Daffodil). 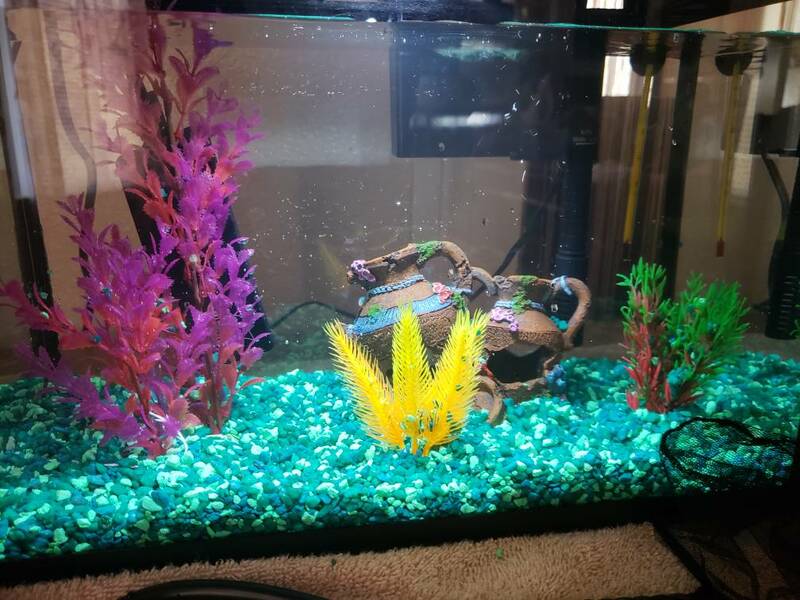 I have literally had these fish for a day and am experiencing some troubles with locating Daffodil. She seems to be a bit shyer than Solana but I don't see any tension or bullying between them. Both were swimming about this morning before feeding and both were out and about when I returned home from work. My husband is home before me a couple hours and also saw that they were amiable, as though carrying on a conversation. When it was time for their evening feeding, I could only spot Solana. I stayed for a moment to watch and see when Daffodil would appear and start nipping at the flakes but she never did! I thought she might be napping and left the tank. Returning 30 minutes later, I still cannot find her. I have four decorations in my tank, three artificial plants and one set of broken vases. Daffodil was not hiding in any of these nor was she behind the heater. My husband even went as far as removing the filter cap to see if she had gotten in there somehow. I dimmed the lights and left the tank again for about 30 minutes. One final search and I still cannot find her. I have now turned off all lights in the room to signal the offical end of the day. I am worried she might be under the gravel and that she is experiencing some type of stress but I do not see any abnormal piles of gravel. Or that she is camouflaging, if that's possible. Re: Mickey Mouse Platy in Hiding! First off the Mickey Mouse Platy is a very peaceful fish and can live sociably with a wide variety of other fish and other platys, so for it to go missing is making me think that it might of been sick when you first got it and it as hidden some were in the tank which you should still be able to find it. Or it could of jumped out of the tank if the lid was off at any time when you were not around, I can't see it trying to get itself under the gravel unless you were moving stuff around at the time. I do hope you find it soon ….please let us know. She didn't jump out! I checked the floor frantically. Turns out she plays hide n seek, finally showing herself this morning.